Premium vitamin B-12 supplement for Horses, Cattle, Sheep, Goats, Swine, Chickens, Dogs, Cats, and Rabbits. This is a super-concentrated (10,000 mcg. per oz.) mixture of pure B-12 in a very palatable base. 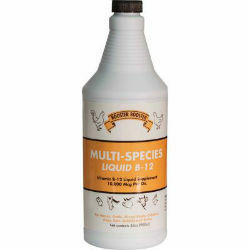 Multi-Species Liquid B-12 may be mixed in feed or administered orally with a dose syringe. RABBITS - 1cc to 3cc. Store in a cool, dry place. Keep from freezing. Keep out of reach of children. For animal use only. Water, Vitamin B-12 supplement, Sodium Benzoate (a preservative), Potassium Sorbate (a preservative), Sodium Saccharin, Xanthan Gum, Artificial Flavoring and Artificial Coloring.